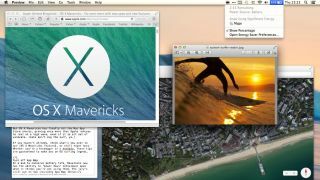 Apple released a critical Mavericks OS X update in an effort to patch Mac computers that were vulnerable to an SSL security flaw. Today's OS X 10.9.2 update fixes the same nasty bug that had affected iPhone and iPad users before last week's just-as-important iOS 7.0.6 update. At the source of the problem was bad code in the form of missing validation steps on both Mac computers and iOS devices. This left users open to hackers when submitting information through SSL encrypted websites that were not authenticated properly. The patch can be applied by opening the App Store on Mac computers. It's located in the Applications menu by default. The Mavericks update release notes indicate that FaceTime audio calls are now possible via Apple computers, officially making it a cross-platform voice over IP service. The update also builds call waiting into FaceTime and iMessages received a handy feature that allows users to block specific message senders. The final major fixes in today's update deal with Mail. Apple has improved the accuracy of the unread count and the ability to receive new messages from certain providers. More on this - SSL hell: Apple's software isn't good enough.